Wheel of Jackpots New at Videoslots Casino - Win Daily Jackpots! Videoslots Casino is by far the biggest casino on the internet. On Videoslots.com you find over 3.300 casino games. You can play these games on your desktop, tablet, smartphone or Smart TV. Videoslots is very popular because they offer a lot of nice features for their players. All players receive a weekly weekend booster, daily clash of spins, Tuesday Madness, battle of Slots and from today The Wheel of Jackpots. Every player at Videoslots now has a chance to win daily jackpots. Spin the Wheel of Jackpots and win a Mini, Major or Mega jackpot. Participation is 100% free. On this page I am going to tell you more about the Wheel of Jackpots and the Tuesday Madness. You also find more information about Videoslots casino in this post. And of course we arranged an interesting bonus for players that never played at Videoslots before. Today Videoslots launched a brand new feature at their online casino. They introduce The Wheel of Jackpots! Videoslots gives every player an unmissable opportunity to try their luck on exclusive jackpot offers. Are you the next player who wins a Mini, Major or Mega jackpot at Videoslots? How can I try to win a jackpot at Videoslots casino? When you decide to join Videoslots Casino you automatically participate in the Wheel of Jackpots. Play slots at the casino and try to complete achievements. The more achievements you complete the more spin rewards you collect. With every spin reward you have a chance to win one of the available jackpots. When you complete an achievement you collect a thropy. In your account you can find all trophies in “My achievements”. Behind selected trophies there are hidden spin rewards. Spin rewards are randomly hidden behind your achievements. On a certain day you could have 10 spin rewards and on the next you only one. Click on the spin reward and the Wheel of Jackpot opens. Spin the Wheel and see if you are one of the lucky players who wins a jackpot at Videoslots Casino. Register a free account at Videoslots Casino and play the Wheel of Jackpots. What are achievements and how can I complete them? At Videoslots every player can complete achievements. You complete achievements while you are playing Slots. A big win, a mega win, a few wins in a row are all achievements you can complete. In your account you see a section “My achievements”. In this section you can see which achievements you already completed and which achievements are still open. We recommend you to play a lot of different games because it is easier to complete achievements on games you never played before. Achievements are not based on your spin value. You can reach the same achievements when you play with low value spins. I actually recommend you to play with low spin value because you can complete more achievements with a relative low amount of money. You can also follow your progress at the right bottom corner of the website. While you are playing you see a red number in the corner. Click on that number and you see your recent achievements. And you can also see how much money you earned for the weekly weekend booster. There are two types of game wheels at Videoslots. In your achievements you can see which trophies you have won and for which “game wheel” you won a free spin. On both wheels you find different kind of prizes. Once you won a free spin you always win a prize on the game wheels. Prizes vary from free spins, free play money, battle tickets to different jackpots. For access to the Bluw wheel you need to collect spin rewards. Spin rewards are hidden behind random trophies (achievements). Once you hit a spin reward you find it in your profile under “My rewards”. 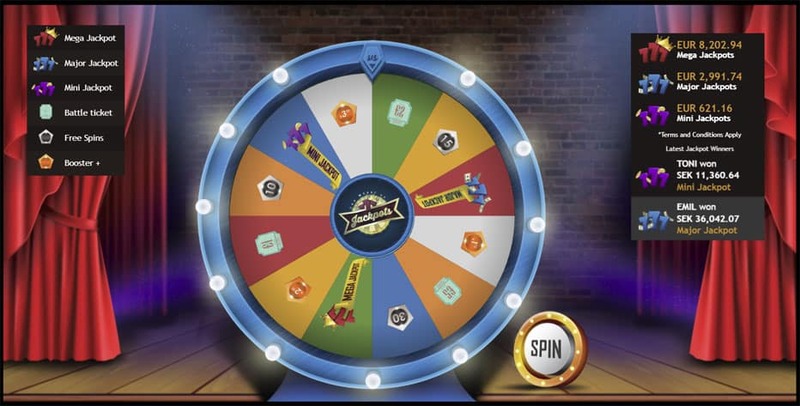 Click on the Blue reward and Videoslots opens the Blue game wheel for you. You can access the red wheel once you completed all trophies in a game. Prizes on the red wheel are higher because it is hard to complete all trophies on one game.We recommend our visitors to play slot games with a low spin value. When you use low spin values you can make more spins with the money you deposited at Videoslots casino. When you deposit €20 at Videoslots you receive €50 from the casino. Videoslots doubles your first deposit and they also add €10 extra play money in your account. Play with €0,20 per spin and you are able to make a lot more spins than when you play €0,40 per spin. You can make twice as many spins in this case. So you have twice as many chance to complete achievements. At Videoslots you can reach certain levels while you are playing. These levels are called XP levels. In total there are 500+ XP levels. Every 5th XP level you complete you win a trophy. You can also find these trophies under “My achievements”. When you win an XP thropy you earn a spin on the XP Wheels. Wheels will be more valuable when you reach higher levels. Each XP level has a different tupe of wheel. While you are playing yourself to a higher level you can earn spins on the following wheels. You can also access the Global Wheel. In order to access this wheel you have to win Green Wheel rewards. 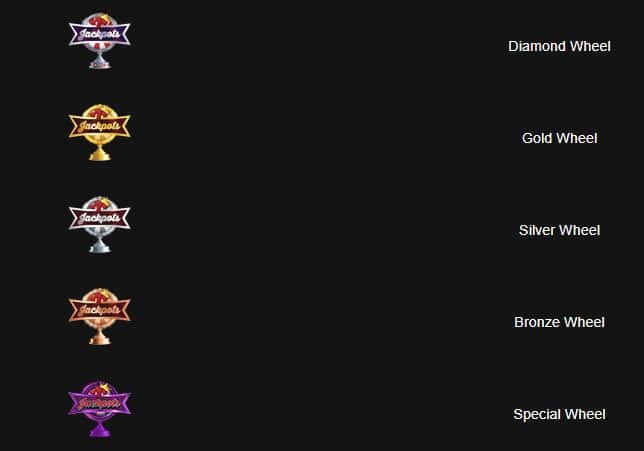 Green Wheel rewards are hidden behind the following trophies. On the XP Wheels there are multiple rewards you can win. You can win jackpots, free spins, battle tickets, boosters or free cash. But you can also win rewards to a higher XP Wheel. On each wheel you see a symbol with the word “jackpot” in it. When your spin ends on this symbol you receive a spin on a higher XP wheel. On higher XP wheels you are able to win more valuable prizes. Underneath you see the symbols you need to spin when you want to win a spin on a higher XP wheel. We made a special deal with Videoslots Casino. 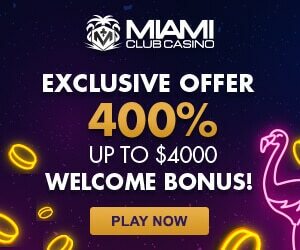 All visitors of BestBettingCasinos.com receive 3 bonuses when they join Videoslots. You receive €10 free cash, 11 wager free spins and 100% Bonus when you register a free account at the casino. This bonus is the perfect start to earn some spins on the Wheel of jackpot. With this bonus you are able to collect up to €210 free play money. You can use this money at the casino and it is an extra chance to win a lot of free spins on the Wheel of jackpots. Maybe you are one of the lucky players that wins one of the jackpots. Make a €20 deposit and you receive €30 extra from Videoslots Casino. 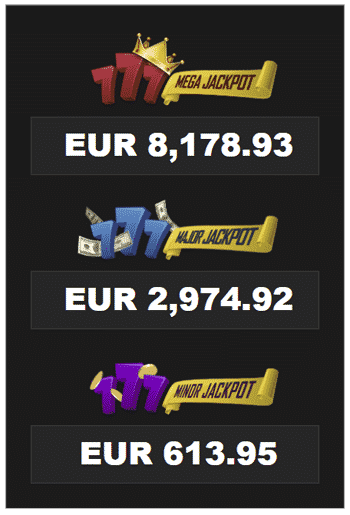 In total you are able to play with €50 when you decide to make a €20 deposit. Isn’t that interesting? Open Videoslots.com and register your free account today! Open a new account at Videoslots Casino – When you are new it is easier to reach new XP levels. You receive free spins when you reach new XP levels. Play with relative low spins values – With a low spin value you have more spins for your budget. You have more chances to complete achievements. Use the available welcome bonus – With the Videoslots bonuses you receive 100% extra play money and €10 extra cash in your account. Play new games – It is easier to complete achievements at new games. Play games you never played before – It is easier to complete achievements at games you never played before. 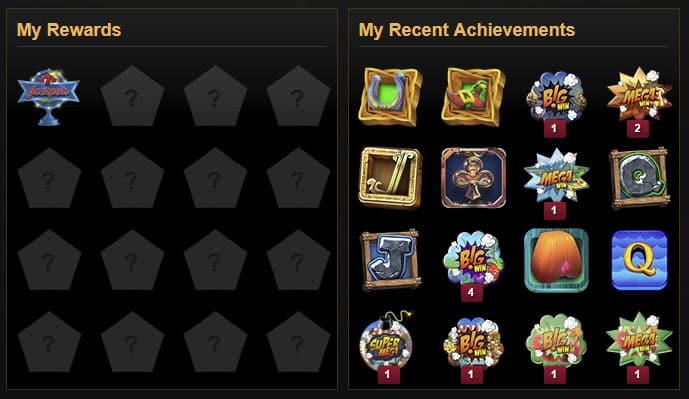 Keep an eye on your “My achievements” page – Sometimes you randomly receive a free spin on one of the Jackpot Wheels. Use random bonuses you receive from Videoslots – With bonuses you always have extra chances of winning free jackpot spins.